Low-intensity flames travel across the forest floor during a carefully planned prescribed burn at the Museum. This spring, one cloudy May day, we watched flames creep across the floor of part of the Museum’s ponderosa pine forest. For a long time, we had been carefully planning for this prescribed burn of a portion of our acreage. The fire, though low intensity, still left a somewhat dramatic sight for our visitors the next day. While some understood what we’d done and why, others came with questions. Some were curious, a few concerned. Why would we set the beautiful forest on fire, leaving the ground blackened and stumps smoldering? In short, for the health of the forest and the safety of the Museum and our community. It’s called a prescribed burn for this very reason. Flames belong in the forest, an ecosystem that has evolved to withstand, and benefit from, the heat. Historically, low-intensity wildfires would burn through a ponderosa forest every five to 20 years. This would help to clear out shrubs, saplings and some of the pine needles and other litter lying beneath the trees. Larger trees would remain intact, their thick bark serving as a shield. 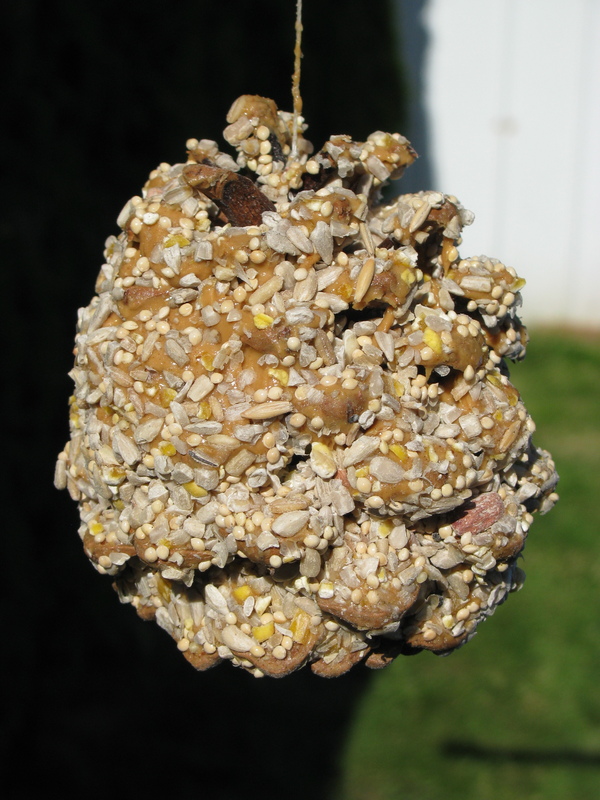 The heat would open ponderosa cones and enable them to release seeds, continuing the natural cycle. For centuries, people have suppressed wildfires in the West. Fuels have built up on the forest floor, and shrubs and trees have grown into unnaturally thick stands, depriving certain wildlife and plants of the habitat they need to thrive. When lightning or human actions start fires, as they inevitably do, they therefore often burn unnaturally hot and can inflict substantial ecological damage. A high-intensity wildfire would also threaten the Museum, our artifacts and the wildlife in our care. The damage that an out-of-control wildfire could cause is eye-watering — much more so than the smoke from our prescribed burn. We are grateful to the U.S. Forest Service for partnering with us to plan and implement our burn. The process began with removing shrubs and small trees, reducing the fuels that had built up. We checked for ground-nesting birds before we mowed. Some visitors have wondered aloud whether we could have just mowed the forest and left it at that. A low-intensity burn offers some unique effects, however. It increases the availability of nutrients, encouraging native plants to thrive. Fires can also create snags, which provide food and habitat for woodpeckers, bats and others. Only a portion of the property was mowed and burned, increasing the diversity of habitat types for the benefit of a wide range of species. 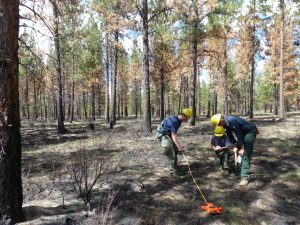 Measurement of ground fuels help U.S. Forest Service managers calculate the percentage of fuels removed by the Museum’s prescribed burn. Over the years, we have been seeing fewer raptors and ground-nesting birds on the property. Both trends might be due to the density of vegetation and forest debris. 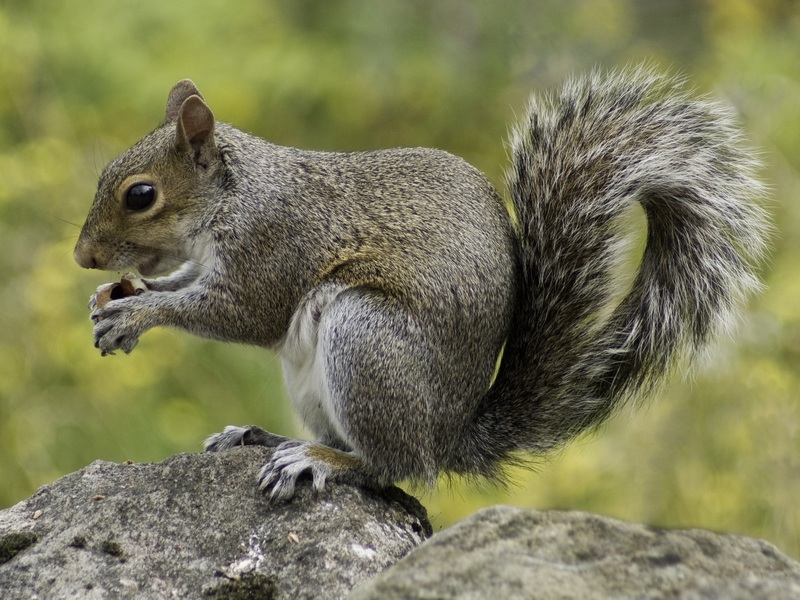 More ground squirrels and other small mammals are able to stay safe under thick cover. Ground-nesters, such as quail, then face pressure from ground squirrels, for whom bird eggs make a tasty meal. The burn has created a more diverse habitat, with some bitterbrush remaining, but also more open areas. 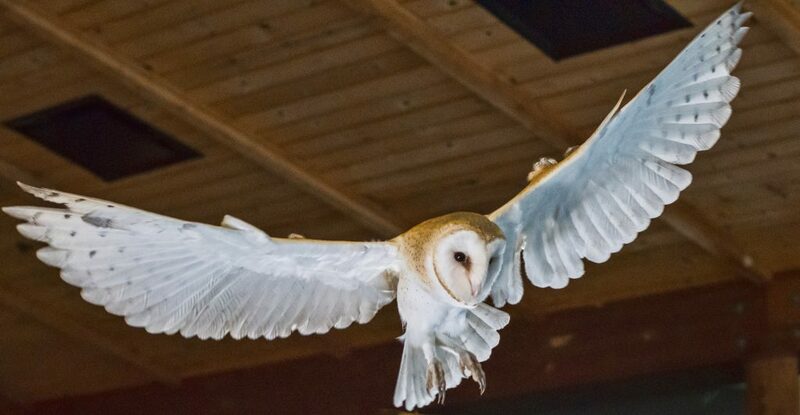 As a result, hawks should now enjoy improved hunting success, which in turn will help to keep the rodent population in check. 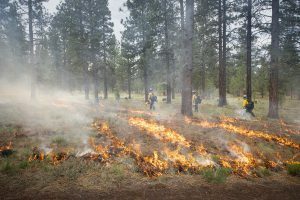 Forest managers always weigh potential benefits against the actual and potential costs of a prescribed burn. In this case, the benefits dwarfed any negatives and we were excited to return fire to the forest. The result should be a revitalized and resilient ecosystem that supports an abundance of native plants and wildlife. 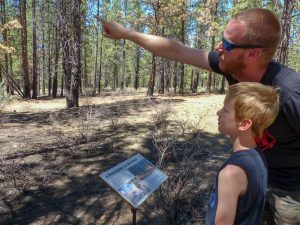 The new interpretive signs along the Museum’s Fire in the Forest Trail offer visitors a chance to understand the important role of fire in ponderosa pine habitats. This burn also provided a fantastic opportunity to connect our community to the importance of forest restoration. Together with the U.S Forest Service, we took photos before and after the burn in specific locations, and will continue to do so for years to come. In doing so, we will capture the restoration process and communicate the important role of fire to our visitors. We also took measurements of the fuels on the ground, so that we can calculate the percentage of fuels that the burn successfully removed. In addition, we have renovated our fire trail, Fire in the Forest, with additional signs along the loop to further explain the role of fire in ponderosa pine ecosystems. Have a look next time you visit the Museum! And watch, too, for the incredible regeneration that will happen in our forest over the next few months and years. 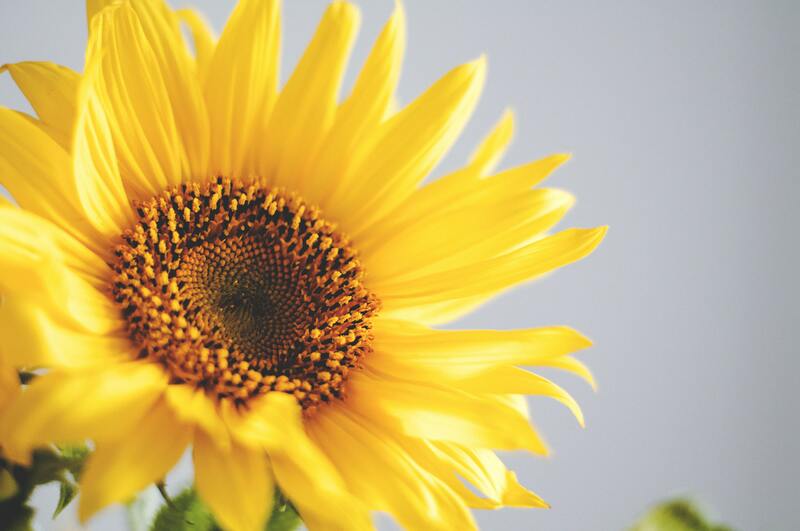 We are already seeing small signs of new life. 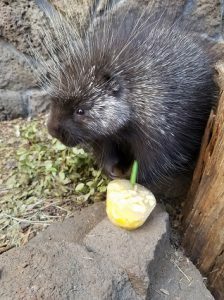 Here at the High Desert Museum, we’re taking steps to keep the wildlife in our care healthy and safe during this summer’s high temperatures, like providing fruit pops to the porcupines and spritzing the raptors with water. The otters? They’re content swimming and sunbathing. Caring for them in this extreme heat made us think of you and your beloved pets. We thought we’d share some simple things you can do to keep your pets safe at home and as you travel this summer. 1. Offer plenty of cool, fresh drinking water to keep your pet hydrated. 2. Dogs transpire through their foot pads, so offering cool water for them to stand in is an excellent and safe method to cool them off. During backyard play, sprinklers and kiddie pools are a fun and effective method of keeping cool while getting in some exercise. 3. Brushing your pets regularly can help keep them cool by removing excess fur. Avoid shaving or trimming the fur to short when grooming, as this can lead to sunburn. Pro tip: wet a cloth with cool water and pet your dog or cat with it. This aids in removing shed fur, as well as cooling. 4. Frozen treats are a great way to keep your pets cool! To help with hydration, freeze water with a bit of fruit for flavoring. (Avoid grapes and raisins, as these can be extremely toxic to animals.) Quick recipe: fill a yogurt cup or similar sized container with water, then stir in a tablespoon of plain applesauce (no sugar or cinnamon added). Pop in the freezer until solid. 5. When your pets are inside, ensure that the temperature stays cool by leaving the AC on. If you do not have AC, circulate the air with fans. Elevating their beds can also help by allowing air to flow underneath them. 6. Most importantly, never leave your pet in your car, and always allow them reprieve from direct sun. Fifteen minutes in 90 degree heat is enough to cause heat stroke in your pet. Always offer shade and/or the ability to come inside.